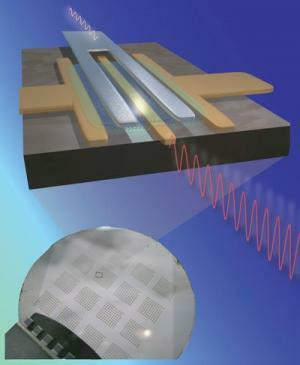 IBM Research has fabricated new 100-Ghz Graphene RF-transistors on 2" wafers. IBM says that the transistors, which operate at room temperature are the fastest available expect the fastest GaAs transistors, and are more than twice faster than silicon transistors with the same gate length (40Ghz). IBM's next aim is to increase the speed of the Graphene transistor to 1 Thz. The Graphene RF transistors were created for the Defense Advanced Research Project Agency under its Carbon Electronics for RF Applications (CERA) program. The transistors were fabricated at the wafer scale using epitaxially grown graphene processing techniques that are compatible with those used to fabricate silicon transistors.